AFC Fylde fell to only their third league defeat of the season – and a first away from home – after a 2-1 defeat to Dagenham and Redbridge. Despite dominating most of the game at the Chigwell Community Stadium, and taking the lead after 30 seconds through Andy Bond, the Coasters were beaten by strikes from Connor Wilkinson and Jack Munns either side of the break. Dave Challinor made two changes to the side beaten by Leyton Orient a fortnight ago. Danny Williams made his first start for the club, replacing Zaine Francis-Angol who was on international duty. The other change saw Gime Toure replace Serhat Tasdemir on the wing for the Coasters, who could not have had a better start. A long ball over the top found Toure, who beat his marker for pace before pulling the ball back for Danny Rowe. His effort was saved but landed at the feet of Bond, who tucked home from eight yards. The chances kept coming for Fylde who were looking to build on their last away outing at Maidenhead United. Toure had a curling effort superbly saved by Dagenham keeper Elliott Justham, who denied Bond a couple of minutes later. Toure and Rowe had chances down the left but a key turning point was the early substitution of Bond. The midfielder clutched his thigh and, clearly in some discomfort, was replaced by Jim Kellermann. Just before the half-hour, and against the run of play, the hosts were level. A throw-in found Wilkinson, who turned past Neill Byrne and fired the ball into the bottom corner from the edge of the box. The rest of the first half was fairly quiet as Jordan Tunnicliffe’s header looped onto the roof of the net while Rowe tried his luck from an acute angle. Fylde started the second half brightly and were inches away from regaining the lead when Rowe’s glancing header fell just wide. Kellermann’s shot into the ground bounced over the bar before the Daggers took the lead with 25 minutes left. An excellent through ball to Chike Kandi down the right wing saw the youngster’s low cross fired home by Munns. The Coasters almost responded quickly as Nick Haughton’s powerful effort clipped the outside of the post. Ashley Hemmings replaced Williams and looked to impress down the left side. Jay Lynch was called into action to deny Harry Phipps’ low shot before his opposite number, Justham, once again produced magic in the Dagenham goal. A low effort from Haughton was deflected and wrongfooted the keeper but some lightning quick reactions saw him punch to Toure, who saw his low shot blocked. Dagenham almost sealed the win late on as Kandi was found in space on the left. 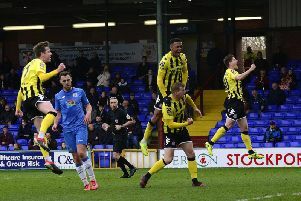 Lynch came out to narrow the angle but the Dagenham forward instead played the ball to Matt Robinson, who saw his shot blocked on the line by Byrne. Justham would then deny the Coasters with one last brilliant save. Another delivery from Luke Burke was met by Toure, whose powerful header was tipped over for a corner. The was the last chance for either side and the final whistle signalled back-to-back defeats for the Coasters. Dagenham and Redbridge: Justham, Nunn, Onariase, Goodliffe, Pennell, Robinson, Phipps, McQueen, Munns (Gordon 78), Balanta (Adeloye 88), Wilkinson (Kandi 57). Subs not used: Moore, Wright. AFC Fylde: Lynch, Burke, Byrne, Tunnicliffe, Williams (Hemmings 68), Croasdale (Tasdemir 84), Bond (Kellermann 24), Philliskirk, Toure, Rowe, Haughton. Subs not used: Brewitt, Birch.